If the semi-diameter of a sphere of the same density as the Sun were to exceed that of the Sun in the proportion of 500 to 1, a body falling from an infinite height towards it would have acquired at its surface greater velocity than that of light, and consequently supposing light to be attracted by the same force in proportion to its vis inertiae, with other bodies, all light emitted from such a body would be made to return towards it by its own proper gravity. ୧୭୯୬ ରେ, ଗଣିତଜ୍ଞ ପିଅର୍-ସାଇମନ୍ ଲାପ୍ଲାସ୍ ନିଜ ବହି Exposition du système du Mondeର ପ୍ରଥମ ଓ ଦ୍ୱିତୀୟ ସଂସ୍କରଣରେ ଏହି ଆଇଡିଆର ପ୍ରଚାର କରିଥିଲେ । (ଏହାକୁ ପରବର୍ତ୍ତୀ ସଂସ୍କରଣ ଗୁଡ଼ିକରେ ବାଦ୍ ଦିଆଯାଇଥିଲା ।). Such "dark stars" were largely ignored in the nineteenth century, since it was not understood how a massless wave such as light could be influenced by gravity. ଅତିଗୁରୁ କୃଷ୍ଣଗର୍ତ୍ତ ~୧୦୫ରୁ ୧୦୧୦ ସୌରବସ୍ତୁତ୍ୱ ~୦.୦୦୧ରୁ ୪୦୦ ଏ.ୟୁ. ଜାଗତିକ କୃଷ୍ଣଗର୍ତ୍ତ ~୧୦ ସୌରବସ୍ତୁତ୍ୱ ~୩୦ କି.ମି. ↑ Wald, R. M. (1997). "Gravitational Collapse and Cosmic Censorship". arXiv:gr-qc/9710068 [gr-qc]. ↑ Overbye, Dennis (8 June 2015). "Black Hole Hunters". NASA. Retrieved 8 June 2015. ↑ Schutz, Bernard F. (2003). Gravity from the ground up. Cambridge University Press. p. 110. ISBN 0-521-45506-5. ↑ Davies, P. C. W. (1978). "Thermodynamics of Black Holes" (PDF). Reports on Progress in Physics. 41 (8): 1313–1355. Bibcode:1978RPPh...41.1313D. doi:10.1088/0034-4885/41/8/004. Archived from the original (PDF) on 10 May 2013. ↑ Overbye, Dennis (15 June 2016). "Scientists Hear a Second Chirp From Colliding Black Holes". New York Times. Retrieved 15 June 2016. ↑ Ellis-Petersen, Hannah (2019-04-11). "Katie Bouman: the 29-year-old whose work led to first black hole photo". The Guardian (in ଇଂରାଜୀ). ISSN 0261-3077. Retrieved 2019-04-18. ↑ Michell, J. (1784). "On the Means of Discovering the Distance, Magnitude, &c. of the Fixed Stars, in Consequence of the Diminution of the Velocity of Their Light, in Case Such a Diminution Should be Found to Take Place in any of Them, and Such Other Data Should be Procured from Observations, as Would be Farther Necessary for That Purpose". Philosophical Transactions of the Royal Society. 74 (0): 35–57. Bibcode:1784RSPT...74...35M. doi:10.1098/rstl.1784.0008. JSTOR 106576. ↑ Gillispie, C. C. (2000). Pierre-Simon Laplace, 1749–1827: a life in exact science. Princeton paperbacks. Princeton University Press. p. 175. ISBN 0-691-05027-9. ↑ Israel, W. (1989). "Dark stars: the evolution of an idea". In Hawking, S. W.; Israel, W. 300 Years of Gravitation. Cambridge University Press. ISBN 978-0-521-37976-2. ↑ Montgomery, Colin; Orchiston, Wayne; Whittingham, Ian (2009). "Michell, Laplace and the origin of the black hole concept". Journal of Astronomical History and Heritage. 12: 90–96. Bibcode:2009JAHH...12...90M. 2009JAHH...12...90M. Retrieved 2016-07-08. ↑ Schwarzschild, K. (1916). "Über das Gravitationsfeld eines Massenpunktes nach der Einsteinschen Theorie". Sitzungsberichte der Königlich Preussischen Akademie der Wissenschaften. 7: 189–196. and Schwarzschild, K. (1916). "Über das Gravitationsfeld einer Kugel aus inkompressibler Flüssigkeit nach der Einsteinschen Theorie". Sitzungsberichte der Königlich Preussischen Akademie der Wissenschaften. 18: 424–434. ↑ Droste, J. (1917). "On the field of a single centre in Einstein's theory of gravitation, and the motion of a particle in that field" (PDF). Proceedings Royal Academy Amsterdam. 19 (1): 197–215. ↑ Kox, A. J. (1992). "General Relativity in the Netherlands: 1915–1920". In Eisenstaedt, J.; Kox, A. J. Studies in the history of general relativity. Birkhäuser. p. 41. ISBN 978-0-8176-3479-7. ↑ 't Hooft, G. (2009). "Introduction to the Theory of Black Holes" (PDF). Institute for Theoretical Physics / Spinoza Institute: 47–48. ↑ Venkataraman, G. (1992). Chandrasekhar and his limit. Universities Press. p. 89. ISBN 81-7371-035-X. ↑ Detweiler, S. (1981). "Resource letter BH-1: Black holes". American Journal of Physics. 49 (5): 394–400. Bibcode:1981AmJPh..49..394D. doi:10.1119/1.12686. ↑ Harpaz, A. (1994). Stellar evolution. A K Peters. p. 105. ISBN 1-56881-012-1. ↑ Ruffini, R.; Wheeler, J. A. (1971). "Introducing the black hole" (PDF). Physics Today. 24 (1): 30–41. Bibcode:1971PhT....24a..30R. doi:10.1063/1.3022513. ↑ Finkelstein, D. (1958). "Past-Future Asymmetry of the Gravitational Field of a Point Particle". Physical Review. 110 (4): 965–967. Bibcode:1958PhRv..110..965F. doi:10.1103/PhysRev.110.965. ↑ Hewish, A. (1970). "Pulsars". Annual Review of Astronomy and Astrophysics. 8 (1): 265–296. Bibcode:1970ARA&A...8..265H. doi:10.1146/annurev.aa.08.090170.001405. ↑ "Inside a black hole". Knowing the universe and its secrets. Retrieved 2009-03-26. ↑ Emparan, R.; Reall, H. S. (2008). "Black Holes in Higher Dimensions". Living Reviews in Relativity. 11 (6). arXiv:0801.3471. Bibcode:2008LRR....11....6E. doi:10.12942/lrr-2008-6. ↑ Obers, N. A. (2009). Papantonopoulos, Eleftherios, ed. "Black Holes in Higher-Dimensional Gravity". Lecture Notes in Physics. Lecture Notes in Physics. 769: 211–258. arXiv:0802.0519. doi:10.1007/978-3-540-88460-6. ISBN 978-3-540-88459-0. ↑ Lewis, G. F.; Kwan, J. (2007). "No Way Back: Maximizing Survival Time Below the Schwarzschild Event Horizon". Publications of the Astronomical Society of Australia. 24 (2): 46–52. arXiv:0705.1029. Bibcode:2007PASA...24...46L. doi:10.1071/AS07012. Ferguson, Kitty (1991). Black Holes in Space-Time. Watts Franklin. ISBN 0-531-12524-6. Hawking, Stephen (1988). A Brief History of Time. Bantam Books, Inc. ISBN 0-553-38016-8. Hawking, Stephen; Penrose, Roger (1996). The Nature of Space and Time. Princeton University Press. ISBN 0-691-03791-4. Pickover, Clifford (1998). Black Holes: A Traveler's Guide. Wiley, John & Sons, Inc. ISBN 0-471-19704-1. Stern, B. (2008). "Blackhole". , poem. Thorne, Kip S. (1994). Black Holes and Time Warps. Norton, W. W. & Company, Inc. ISBN 0-393-31276-3. Wheeler, J. Craig (2007). Cosmic Catastrophes (2nd ed.). Cambridge University Press. ISBN 0-521-85714-7. Carroll, Sean M. (2004). Spacetime and Geometry. Addison Wesley. ISBN 0-8053-8732-3. , the lecture notes on which the book was based are available for free from Sean Carroll's website. Chandrasekhar, Subrahmanyan (1999). Mathematical Theory of Black Holes. Oxford University Press. ISBN 0-19-850370-9. S. W. Hawking, G. F. R. Ellis. ; Ellis, G. F. R. (1973). Large Scale Structure of space time. Cambridge University Press. ISBN 0-521-09906-4. Taylor, Edwin F.; Wheeler, John Archibald (2000). Exploring Black Holes. Addison Wesley Longman. ISBN 0-201-38423-X. Thorne, Kip S.; Misner, Charles; Wheeler, John (1973). Gravitation. W. H. Freeman and Company. ISBN 0-7167-0344-0. Wald, Robert M. (1992). Space, Time, and Gravity: The Theory of the Big Bang and Black Holes. University of Chicago Press. ISBN 0-226-87029-4. Gallo, Elena; Marolf, Donald (2009). "Resource Letter BH-2: Black Holes". American Journal of Physics. 77 (4): 294. arXiv:0806.2316. Bibcode:2009AmJPh..77..294G. doi:10.1119/1.3056569. Hughes, Scott A. (2005). 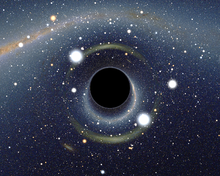 "Trust but verify: The case for astrophysical black holes". arXiv:hep-ph/0511217 [hep-ph]. Lecture notes from 2005 SLAC Summer Institute.